Fatteh or fattah is an Arabic dish that uses pieces of toasted or fresh flatbread as a foundation upon which various ingredients are added on top. Fatteh can be made with chickpeas (Arabic: Fattet Hummus), or with chicken (Arabic : Fattet Dajaj), or with eggplants (Arabic: Fattet Makdous). Fattet Hummus Bel-Laban: it is made by layering crispy flatbread, topped with yogurt sauce, then topped with chickpeas. Fattet Hummus Bet-Tahineh: is made by layering crispy flatbread, topped with (Hummus Tahini dip: chickpeas blended with tahini and lemon juice). In Damascus it is called “Tesqieh Bel-Badweh”. Fattet Hummus Bez-Zeit: dried chickpeas are cooked in water until tender but not mushy. Then in a blender the sauce is prepared (put in blender chickpeas cooking water (the water which was used to cook the chickpeas), garlic, baking soda, salt and blend, then slowly add olive oil until the mixture turns into white in color, this mixture is called “Faqseh”). Then the fatteh is prepared by layering crispy flatbread, topped with chickpeas, then topped with Faqseh. Garnished with cumin. This fatteh in Damascus is called ” Tesqieh Bel-Faqseh”. Fattet Hummus Helweh: is made by saute onion in ghee until transparent, then cooking the onions in chickpeas cooking water. Then the fatteh is prepared by layering crispy flatbread, topped with the onion with the cooking water, then topped with chickpeas, and heated ghee is added at top. This is a specialty of Hama. 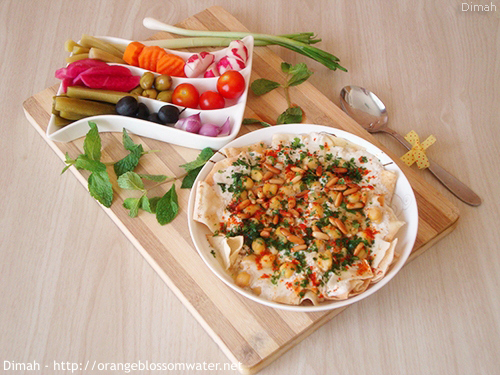 Today’s recipe is Fattet Hummus Bel-Laban. Later, I’ll post recipes about all the other types.